Swansea City chairman Huw Jenkins has denied two of the club's former directors were unfairly dismissed and discriminated against due to their age. Steve Penny, 62, and Don Keefe, 79, made the claims following a takeover of the Premier League club. Both allege they were told to resign or risk being sued for potentially jeopardising the sale of shares. Mr Jenkins told an employment tribunal in Cardiff that he wanted them both to stay with the club as non-directors. "I said they should stay on as employees of the football club and they would be well looked after," he said. All three were a part of the local consortium which took control of Swansea in 2002. 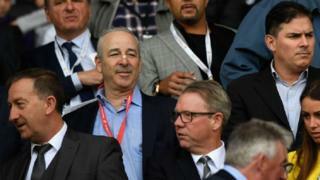 With Mr Jenkins appointed chairman and Mr Penny and Mr Keefe working as legal and finance directors respectively, the group guided the Swans from the bottom tier of English football to the Premier League in just nine years. Mr Jenkins shared an office with Mr Keefe and said he used to "discuss everything" with his colleague. The Swans were taken over in 2016 by an American consortium led by Jason Levien and Steve Kaplan. Mr Keefe - who later departed with Mr Penny and fellow long-time director, the late Gwilym Joseph - requested a payment from Mr Jenkins. He claims the chairman said the three men - who were not shareholders - "should be compensated" but Mr Jenkins disputed it saying "it was not like that". Mr Keefe also alleges Mr Jenkins did not give them details of the takeover until the deal was done. But the Swans chairman said he did not want to disclose details before the sale was completed, for fear of it leaking to the media. He also said the "whole process was unclear" and that he was under no obligation to inform non-shareholders before the deal was confirmed, adding that individuals' day-to-day roles would not change. At the time of the sale, the club was valued at £110m. Mr Jenkins earned more than £8m for selling an 8.2% stake in the club, leaving him with a 5% shareholding. Mr Keefe and Mr Penny also allege their departures were related to age discrimination, instigated by club director and shareholder Martin Morgan. It was put to Mr Jenkins that he agreed with Mr Morgan, who was accused of saying Mr Penny, Mr Keefe and Mr Joseph should leave and be replaced by younger directors. "I do not think so, no," said Mr Jenkins. "What I said was the club needed to change and that's why we needed the new shareholders." The hearing continues at Cardiff Magistrates' Court on Wednesday.